The impact of kingdoms of Karnataka origin have been felt over other parts of India also. The Chindaka Nagas of central India, Gangas of Kalinga (Odisha), Rashtrakutas of Manyakheta, Chalukyas of Vengi, Yadava Dynasty of Devagiri were all of Kannada origin who later took to encouraging local languages. In the medieval and early modern periods, the Vijayanagara Empire and the Bahmani Sultanate became the major powers in Karnataka. The latter disintegrated to form five Deccan Sultanates. The Deccan Sultanates defeated the Vijayanagara Empire in 1565. After the Anglo-Mysore Wars, where the East India Company defeated the forces of Tipu Sultan, Company Rule began in India. Karnataka was divided between Bombay State, Mysore State, and Hyderabad State. Formal rule under the British Crown began in 1858. During this time, railways and airways, as well as modern universities were introduced in Karnataka. India became Independent in 1947, and the Kingdom of Mysore and Hyderabad State were integrated into India. According to the States Reorganization Act, 1956, the Kannada-speaking areas of Hyderabad State, Madras State were unified with Mysore State. The state was renamed Karnataka in 1973. The credit for doing early extensive study of prehistoric Karnataka goes to Robert Bruce-Foote and this work was later continued by many other scholars. The pre-historic culture of Karnataka (and South India in general) is called the hand-axe culture, as opposed to the Sohan culture of North India. Paleolithic hand axes and cleavers in the shape of pebbles made with quartz and quartzite which have been found in places such as Lingadahalli in Chikkamagaluru district and Hunasagi in Yadgir district, and a wooden spike at Kibbanahalli in Tumkur district are examples of old stone age implements. There are reports that a polished stone axe was discovered at Lingasugur in the Raichur district Neolithic sites (new stone age) of importance are Maski in Raichur district, Brahmagiri in Chitradurga district etc., with abundance of evidence that man begun to domesticate animals such as cows, dogs and sheep, use copper and bronze weapons, wear bangles, rings, necklaces of beads and ear-rings and have burial chambers. To the end of the Neolithic era, during the Megalithic age, people in Karnataka began to use long swords, sickles, axes, hammers, spikes, chisels and arrows, all made of iron. Scholarly hypothesis postulates contacts between the Indus Valley (3300 BCE - 1300 BCE) cities of Harappa and Lothal, citing the discovery of gold found in the Harappan sites that was imported from mines in Karnataka. Evidence of Neolithic habitation of areas in modern Karnataka and celts dating back to the 2nd century BCE were first discovered in 1872. There are reports that a polished stone axe was discovered at Lingsugur in the Raichur district; however the authenticity of these reports remains unverifiable. Megalithic structures and burial grounds were discovered in 1862 in the regions of Kodagu and Moorey Betta hills, while Neolithic sites were discovered in north Karnataka. Scholarly hypothesis postulates of contacts between the Indus Valley city of Harappa in 3000 BCE, citing the discovery of gold found in the Harappan sites that was imported from mines in Karnataka. Karnataka was the part of the Maurya Empire, the first Mauryan Emperor Chandragupta Maurya died in Shravanbelgola in Hassan District around 298 BCE where he spent last days of his life as Jain ascetic. Around 230 BCE, the Satavahana dynasty came to power and its rule lasted nearly four centuries, until the early 3rd century CE. The disintegration of the Satavahana dynasty led to the ascent of the earliest native kingdoms, the Kadamba Dynasty of Banavasi in modern Uttara Kannada district with Mayurasharma, a Brahmin native of Talagunda in modern Shivamogga district as the founding king, and the Western Ganga Dynasty in southern Karnataka, marking the birth of the region as an independent political entity. These were the first kingdoms to give administrative status to Kannada language as evidenced by the Halmidi inscription of 450, attributed to King Kakusthavarma of the Kadamba Dynasty. Also, recent discovery of a 5th-century copper coin in Banavasi, ancient capital of the Kadambas, with Kannada script inscription on it, further proves the usage of Kannada at an official level. One of the Badami cave temples, built by the Chalukya dynasty. They were followed by large imperial empires, the Badami Chalukyas, Rashtrakuta Dynasty and Western Chalukya Empire, who had their regal capitals in modern Karnataka region and patronized Kannada language and literature. The Badami Chalukyas ruled between the 6th and the 8th centuries. The Rashtrakutas were originally vassals of the Badami Chalukyas. Dantidurga overthrew the Chalukya ruler Kirtivarman II in 735 CE, and established the ruled of the Rashtrakuta dynasty. During this period, important contributions were made in the field of literature, arts, and mathematics. Amoghavarsha I, the most famous king of this dynasty wrote Kavirajamarga, a landmark literary work in the Kannada language. Important mathematical theories and axioms were postulated by Mahaviracharya. The Western Chalukyas ruled between 973 and 1189 CE. The Western Ganga dynasty was founded around 350 CE, ruling southern Karnataka. Their sovereignty lasted from about 350 to 550 CE, after which they ruled as vassals of the Badami Chalukyas, Rashtrakutas, and Western Chalukyas. Their rule came to an end after the disintegration of the Western Chalukyas in 1000 CE. The Gommateshwara statue at Shravanbelagola was built during the 10th century CE by the Western Ganga Kingdom. Though a small kingdom, the Western Ganga contribution to polity, culture and literature of the modern south Karnataka region is considered important. The Western Ganga kings showed benevolent tolerance to all faiths but are most famous for their patronage toward Jainism resulting in the construction of monuments in places such as Shravanabelagola and Kambadahalli. The kings of this dynasty encouraged the fine arts due to which literature in Kannada and Sanskrit flourished. Elaborately carved outer walls at the Hoysaleswara Temple built in the 12th century by the Hoysala Empire. Natives of the malnad Karnataka, the Hoysalas established the Hoysala Empire at the turn of the first millennium. Art and architecture flourished in the region during this time resulting in distinctive Kannada literary metres and the construction of temples and sculptures adhering to the Vesara style of architecture. The expansion of the Hoysala Empire brought large parts of modern Andhra Pradesh and Tamil Nadu under their rule. The Seuna dynasty, Kadamba dynasty, and Chola Empire ruled parts of Karnataka. Garuda Shrine in the form of a stone chariot. Hampi, the capital of the Vijayanagara Empire was one of the world's largest cities during the medieval period. The city was destroyed by the combined army of five Deccan Sultanates during the Battle of Talikota in 1565. In the early 14th century, the Vijayanagara Empire with its capital at Hosapattana (later to be called Vijayanagara) rose to successfully challenge the Muslim invasions into the South. This empire was established by Harihara I and Bukka Raya who many historians claim were commanders of the last Hoysala King Veera Ballala III and the empire prospered for over two centuries. The Vijayanagara rulers patronized culture, and a distinct form of literature and architecture evolved during this period. The best example of Vijayanagara architecture is seen in the ruined city of Hampi. The main rival of the Vijayanagara empire were the five Deccan Sultanates, who defeated the empire in 1565 at the Battle of Talikota. Two generals of the Vijayanagara army switched sides and turned their loyalty to the united Sultanates. They captured Aliya Rama Raya and beheaded him on the spot. The beheading of Rama Raya created confusion and havoc and in the still loyal portions of the Vijayanagara army, which were then completely routed. The Sultanates' army plundered Hampi and reduced it into ruins. The Bahmani sultans of Bidar were the main competitors to the Vijayanagara empire for hegemony over the Deccan and after their fall, the Bijapur Sultanate and Bidar Sultanate took their place in the dynastic struggle for control of the southern India. A Bidriware water-pipe. Bidriware was developed in Bidar in the 14th century C.E. during the rule of the Bahmani Sultanate. After the defeat and disintegration of the Vijayanagara Empire in battle at Talikota in 1565 to a confederacy of Sultanates, the Bijapur Sultanate rose as the main power in the Deccan before their defeat to the Mughal Empire in late 17th century. Mughal Emperor Aurangzeb gave the order to besiege Bijapur and after a 15-month long siege, the Mughal army emerged victorious and the Adil Shahi dynasty came to an end. The Bahmani and Bijapur rulers encouraged Urdu and Persian literature and Indo Islamic architecture, the Gol Gumbaz being one of the high points of this contribution. Bidriware and Deccan painting developed during this period. The Madrasa Mahmud Gawan was a university built during the reign of the Bahmani Sultanate, one of the few centers of higher learning in medieval India. Parts of Karnataka were conquered by Marathas, earlier under Chhatrapati Shivaji and later on after the War of 27 years. General Lord Cornwallis receiving Tipu Sultan's sons as hostages after the third Anglo-Mysore War, by Robert Home, c. 1793 CE. The Wodeyars of Mysore, former vassals of the Vijayanagara Empire, leased the state from the Mughal king Aurangzeb in the 17th century. With the death of Krishnaraja Wodeyar II, Haider Ali, the Commander-in-Chief of the Mysore Army, assumed control over the region, until the rule of the kingdom was passed to Tipu Sultan, after Haider Ali's death. In attempting to contain European expansion in South India, Tipu Sultan, known as the Tiger of Mysore fought four significant Anglo-Mysore Wars, the last of which resulted in his death and the incorporation of Mysore into the British Raj. Following Tipu's fall, a part of the kingdom of Mysore was annexed and divided between the Madras Presidency and the Nizam. The remaining territory was transformed into a Princely State; the five-year-old scion of the Wodeyar family, Krishnaraja III, was installed on the throne with chief minister (Diwan) Purnaiah. The Mysore State and Hyderabad State, which ruled most of Karnataka, were allied with the British during the Indian Rebellion of 1957. Mysore Palace, completed in 1912, was the residence of the Wadiyar dynasty which ruled the Kingdom of Mysore. During this time, railways and airways, as well as modern universities were introduced in Karnataka. The Indian Institute of Science (1909) and University of Mysore (1916) were the first educational institutions established in Karnataka. 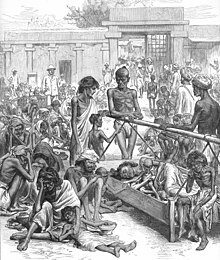 However the British period was also a time of racial discrimination, economic exploitation and numerous preventable famines. By the late 19th century, the independence movement had gained momentum; Aluru Venkata Raya, S. Nijalingappa, Kengal Hanumanthaiah, Nittoor Srinivasa Rau and others carried on the struggle into the early 20th century. The 1957 elections saw the Indian National Congress win 150 seats out of 208, and S. Nijalingappa was retained as Chief Minister. Mysore state was renamed Karnataka in 1973. The Congress would retain power in Karnataka until 1983, when the Janata Party formed the first non-Congress government in Karnataka with the support of other smaller parties. Subsequent elections have seen power switch between the Congress, Bharatiya Janata Party, and other parties. ^ "`First-ever celt was found near Madikeri'". Chennai, India: The Hindu. 2005-01-10. Retrieved 2007-05-06. ^ S. Ranganathan. "THE GOLDEN HERITAGE OF KARNATAKA". Online webpage of the Department of Metallurgy. Indian Institute of Science, Bangalore. Archived from the original on 2007-01-21. Retrieved 2007-06-07. ^ "Prehistoric culture of Karnataka". ourkarnataka.com. Retrieved 2007-05-06. ^ "Trade". The British Museum. Retrieved 2007-05-06. ^ a b "First-ever celt was found near Madikeri". The Hindu. Chennai, India. 2005-01-10. ^ "WebHost4Life - Web Hosting, Unix Hosting, E-Mail, Web Design". www.ourkarnataka.com. Retrieved 22 March 2018. ^ "Ancient India - Staff Room". www.ancientindia.co.uk. Retrieved 22 March 2018. ^ Planet, Lonely. "Best Escape: Shravanabelagola, Karnataka". Lonely Planet India. Retrieved 22 March 2018. ^ Arthikaje, Mangalore. "History of Karnataka-Kadambas of Banavasi". 1998-2000 OurKarnataka.Com,Inc. Retrieved 2006-11-28. ^ Dr. Jyotsna Kamat. "Kadambas of Banavasi". 1996-2006 Kamat's Potpourri. Retrieved 2006-11-28. ^ The Gangas were sons of the Soil - R. S. Panchamukhi and Lakshminarayana Rao Arthikaje, Mangalore. "Gangas of Talkad". 1998-2000 OurKarnataka.Com, Inc. Retrieved 2007-01-18. ^ "5th century copper coin discovered at Banavasi". Deccan Herald. 7 February 2006. Archived from the original on 2006-06-14. Retrieved 2006-08-17. ^ More inscriptions in Kannada are attributed to the Chalukya King Vikramaditya VI than to any other king prior to the 12th century, Kamat, Jyotsna. "Chalukyas of Kalyana". 1996–2006 Kamat's Potpourri. Retrieved 2006-12-24. ^ "Group of Monuments at Pattadakal". UNESCO World Heritage Centre. Archived from the original on 2019-03-23. Retrieved 2019-03-27. ^ "Sacred Ensembles of the Hoysala". UNESCO World Heritage Centre. Archived from the original on 2018-12-04. Retrieved 2019-03-27. ^ a b c "Group of Monuments at Hampi". UNESCO World Heritage Centre. Archived from the original on 2018-12-15. Retrieved 2019-03-27. S. Srikanta Sastri, "Sources of Karnataka History, Vol I (1940)" - University of Mysore Historical Series, University of Mysore, Mysore. Dr. Romila Thapar, The Penguin History of Early India From Origins to 1300 A.D., 2003, Penguin, New Delhi, ISBN 0-14-302989-4. Adiga, Malini (2006) . The Making of Southern Karnataka: Society, Polity and Culture in the early medieval period, AD 400–1030. Chennai: Orient Longman. ISBN 81-250-2912-5. Ramesh, K.V. (1984). Chalukyas of Vatapi. Delhi: Agam Kala Prakashan. ASIN B0006EHSP0. LCCN 84900575. OCLC 13869730. OL 3007052M. This page was last edited on 9 April 2019, at 08:39 (UTC).